The good news is that Aisin will participate at the 2014 North American International Auto Show. The great news is that the Aisin exhibit will be located on the main show floor near General Motors. Aisin took advantage of an opportunity to move upstairs when NAIAS reached out with the invitation, said AWA President, Sales & Marketing, John Koenig. "It's clear that our hard work before and during last year's NAIAS got the attention of show organizers," said Koenig about the invitation to move to the main floor. "This will be an excellent opportunity to receive tremendous exposure for the Aisin brand." He added that the indoor Ride & Drive, which was presented last year as the "Aisin Drive Green Experience," has been discontinued, giving Aisin the distinction of presenting the last Ride & Drive at NAIAS. Koenig said the idea to move upstairs has the full support of Saito-san and Aisin Seiki. "Remember, our objective for participating at NAIAS is to help raise awareness of the Aisin brand in North America; it's our feeling that there is no better way to do that than to participate in one of the world's most important auto shows, and certainly the best in North America," added Koenig. Aisin also exhibits at major motor shows in Paris, Beijing and Shanghai, and will be among the exhibitors at the Frankfurt show in September, and the Tokyo show in October. Meanwhile, a Main Floor location at NAIAS 2014 means Aisin will have greater visibility, and significantly more visitors to its booth, according to NAIAS Executive Director, Rod Alberts. 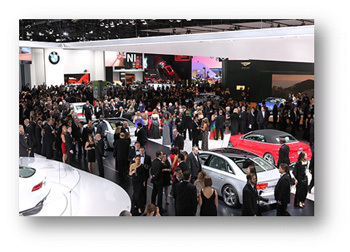 "More than 800,000 people attended NAIAS 2013, with the majority of that time spent at Main Floor exhibits," said Alberts. "Our messages are that NAIAS has become the 'World Stage,' is considered the 'Voice of the Industry,' and that for 25 years, automakers from around the world have designated the Detroit show as the venue of choice for domestic and international vehicle unveilings." 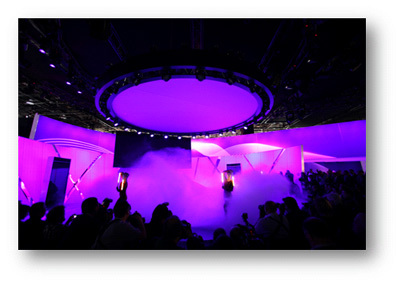 (Like Infiniti did, above, at NAIAS 2013). "When an annual event is covered by more than 5,000 journalists from 62 countries, exhibitor success and experience are ensured," added Alberts. For Aisin the benefits are obvious, as it will be amid all the action, and needs only to reach out and grab its share. From 35 press conferences, access to virtually every automaker in the world, multitudes of press, and live and recorded interview opportunities, to thousands of engineers, technical and product development people, scores of strolling, champagne sipping VIPs, and three quarters of a million car enthusiasts � the main floor is the appropriate location for companies with global leadership positions wishing for a share of the World Stage. As one of four main floor, Tier One suppliers, Aisin will be located in Detroit Hall (between Ford and GM) with Michelin, ZF and Denso. The back wall of the Aisin exhibit will be shared with Nissan, and it will be adjacent to Mazda. Also new is Aisin's relationship with the Derse Exhibit Company, which will provide design and build services, experiential marketing counsel, and help refocus the Aisin marketing strategy at NAIAS. AW Transmission Engineering USA Inc. (AWTEC) celebrated its 25th anniversary in North America this month. In 1988, AWTEC was Aisin AW's first venture outside of Japan, and located in the Detroit area with six employees principally to provide service and technical support to a small number of Japanese customers. Today, the Plymouth-based company provides remanufacturing of automatic transmissions, OE Quality and Technical Support, and OE Sales and Distribution. AWTEC employs more than 230 team members, remanufactures 78 transmission models, and services 17 Japanese, European and domestic auto and truck manufacturers. Recently AWTEC customers and suppliers, members of local government, and Aisin Group company representatives attended the company's anniversary celebration. Among the attendees, Toyota Chief Executive Officer North American Region, Jim Lentz. Others in attendance included AWTEC President Eiji Kato; Michigan State Representative Kurt Heise; Deputy General Consul for Japan Ryoji Noda; and AHA President and CEO Masayasu "Mike" Saito, who called the partnership between AWA and AWTEC a "mutually beneficial relationship" for both companies. Those were the words of Michigan Governor Rick Snyder, who visited FT Techno of America (FTTA) in Fowlerville, Mich., in June. Snyder was traversing the state promoting legislation, and stopped at the Fowlerville Proving Ground in Handy Township at the invitation of AWA President John Koenig. 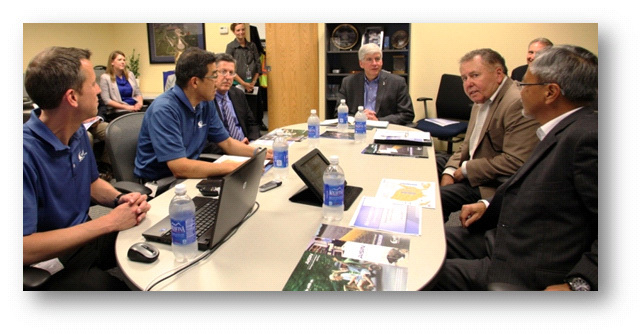 Members of the Michigan Economic Development Corporation accompanied Snyder. 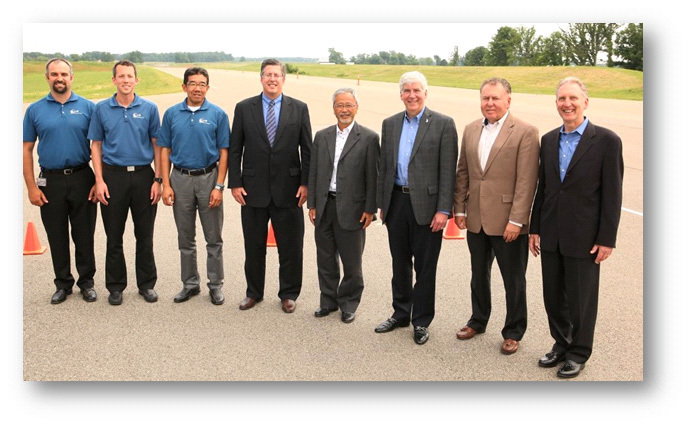 During his visit, Snyder participated in a round table discussion with AWA executives, and rode along on a tour of the facility, which included observing Aisin vehicles on the dynamic skid pan, and in an area composed of ceramic tiles which simulate wet or icy road conditions. The governor congratulated Aisin for its ongoing development and R & D leadership at FTTA, and for providing hi tech jobs. He said he was impressed with the 870-acre facility, adding that its Livingston County location and proximity to Michigan State University and University of Michigan was near perfect. Snyder said the test track is an example of successfully matching talent to jobs in the emerging advanced manufacturing economy, and encouraged Aisin to continue on that path, and to aid his initiative to expand worker skills and match them to jobs in high demand fields. 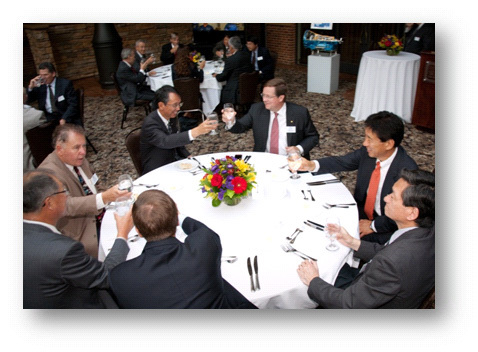 Koenig and the other AWA executives spoke of the company�s success and the strong ties of Aisin to Michigan, including its 646 employees. Koenig said that the company plans on investing $57 million in the state over the next six years. Koenig also discussed the company�s ongoing relationship with Michigan universities and the effort to train and recruit students to the Aisin family. �We show students the positives of working in the auto industry, and how it has evolved in recent years to provide more exciting opportunities," said Koenig. "The industry's in a better place and Aisin, as a top Tier One supplier, is in a strong position to recruit young talent." FTTA, which opened in in 2005, is in the final stages of completing its fifth phase of development. In total, Aisin Seiki has three proving grounds globally, more than any other automotive supplier, and more, even, than some OEMs. Copyright © 2019, Aisin World Corp. of America. All rights reserved.